The Salento growing area of Puglia is a land between two seas. Making up the heel of Italy’s boot, this breezy peninsula is known for olive trees and coastlines offering technicolor views of the Ionian Sea and the Adriatic Sea. Composed of endless stretches of farmland, it produces not only grapes but also wheat and other staple crops. The relatively flat topography of Puglia, the warm climate, and the rich sand-clay soils make the region an agricultural haven. 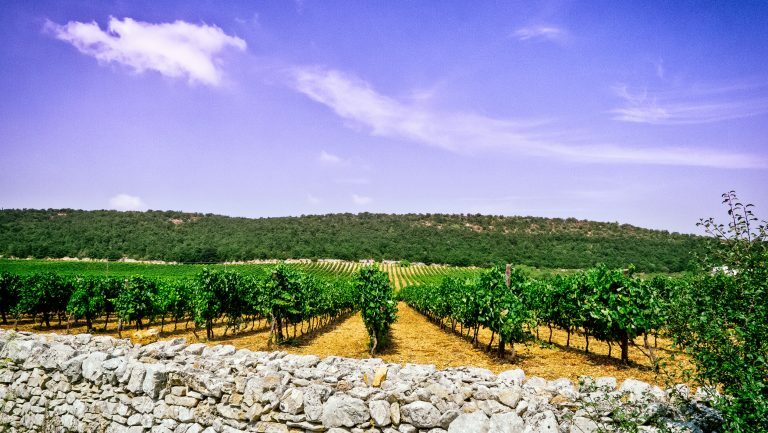 These features also enable Puglia to be a volume leader when it comes to grape growing in Italy; it easily vies with the Veneto and Emilia-Romagna for the distinction of the region that produces the most wine. The spectrum of grapes grown here is noteworthy, too; this is crucial to Puglia’s great cultural—and agricultural—heritage. 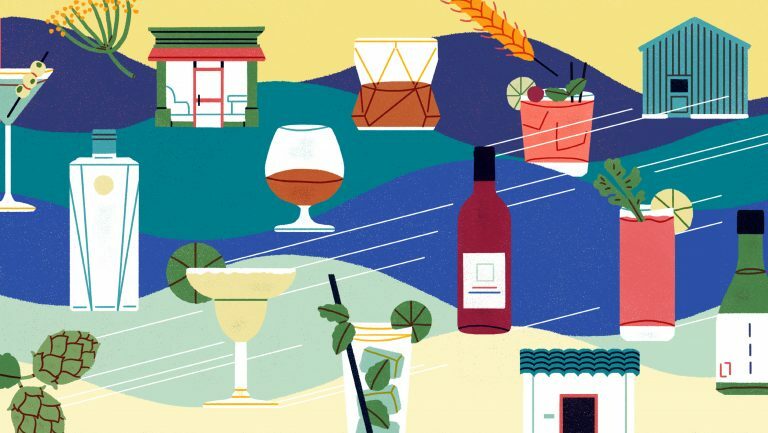 But this abundance can make it challenging to zero in on wines made with thoughtful intention and care; there are countless gallons to wade through, and while more small, family producers are emerging, large corporations still dominate the marketplace. Searching for the gems, though, comes with rewards. Years ago, Primitivo (named for its tendency to ripen early) was the first Puglian grape I really tried to grasp. 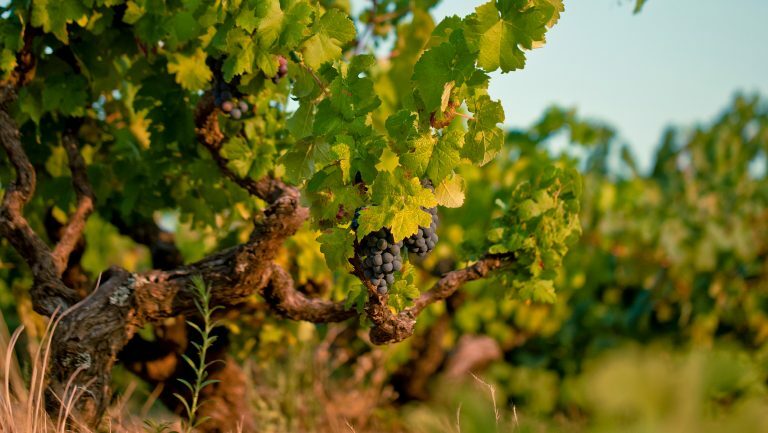 The native grape has a famous California twin, Zinfandel, making it an approachable place to start. Plus, there was a good amount of it coming into the States in the early 2000s. It wasn’t until I had the chance to visit Puglia that it became clear that Primitivo accounted for a relatively small concentration of plantings (mainly in the Manduria, Gioia del Colle, and Salice Salentino areas) when compared with the vast sea of Negroamaro. Quickly, it was Negroamaro that commandeered my attention; the wines expressed depth of fruit without austere tannins, making them very food friendly. For one event, I lined up bottles of Italian wine to pair with a Genovese-style braised meat dish, and of all of them, Negroamaro was easily the best match—and the best price. It reinforced my idea that this grape was undervalued as a versatile, food-friendly red wine. Native to Puglia (and rarely grown elsewhere), Negroamaro is by far this region’s most dominant grape, covering roughly 12,000 hectares (29,652 acres) of land throughout the region, but it is especially widespread on the Salento Peninsula. 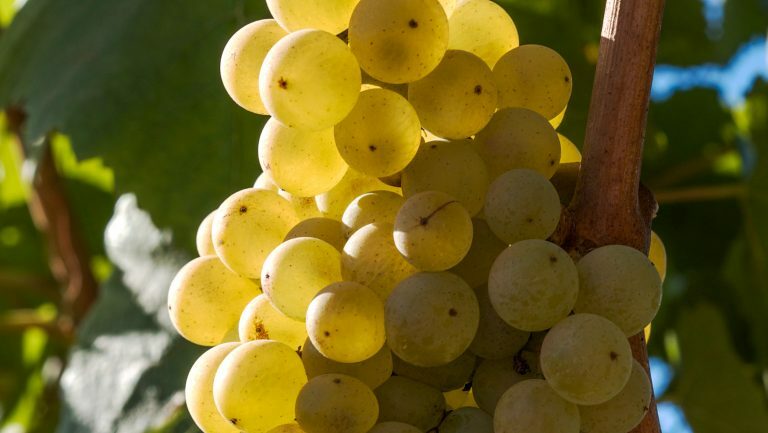 The grape is classically blended with Malvasia Nera but can also stand on its own. 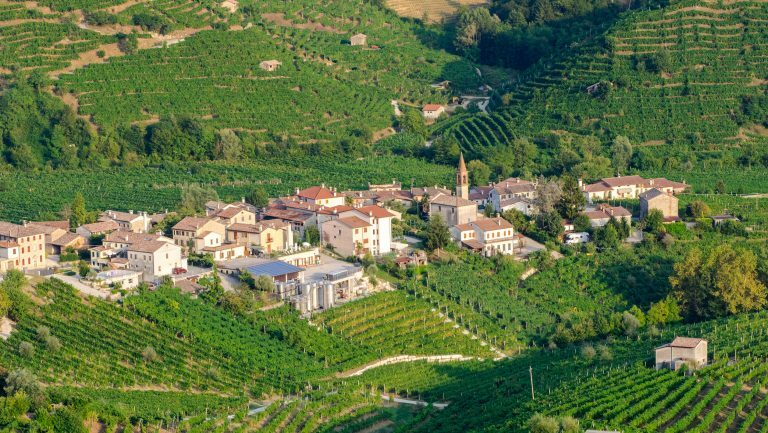 It was the 100 percent Negroamaro wines from producers such as Li Veli, Schola Sarmenti, Rosa del Golfo, and Michele Calo that allowed me to become better acquainted with the native variety. Those who love amaro might make the same mistake I did, believing the word “Negroamaro” translates to “black-bitter,” but the truth is that Negroamaro’s name is just the word “black” repeated in two languages—Greek “mavros” and Latin “niger.” The grape is believed to have been brought to Italy by Greek colonists during the 8th century BC. Some say it might even be related to Xinomavro, but that theory’s not yet established. Pliny the Elder called Manduria viticulosa (full of vineyards) at the height of the Roman Empire, as he called attention to the importance of this region, with Greece nearly on the horizon and the peninsula jutting into the sea. But beyond its history, what I’ve found most extraordinary about Negroamaro—from the medium-bodied wine to the very hearty and rich—is how easily it pairs with the seafood and flavors of Puglia. The sun-kissed grapes have a natural ripeness and roundness of tannins that complement the briny flavors of the sea, olives, and the bitterness of local greens. So while the grape isn’t bitter in any classic sense, it’s great for balancing bitter vegetables, especially greens like rapini (in Puglia, this is served with orecchiette and fennel sausage), seafood stews, and braised dishes. At my San Francisco restaurant A16, we love to pair it with pizzas with anchovies, olives, and Calabrian chile oil because the wine’s acidity and stewed fruit flavors are perfect matches for everything salty and spicy—it’s also great with dishes from outside Italy that contain some heat and a variety of flavors. For years, my benchmark Negroamaro was one from Cosimo Taurino, a seventh-generation producer in Salice Salento. To me, his Patriglione is one of Italy’s landmark red wines, able to stand up to the great wines of Italy—and to surprise wine enthusiasts who have never had it with how complex and thoughtful Negroamaro can be. Made from a 35-hectare (86-acre) vineyard planted on calcareous soil, Patriglione reflects Dr. Taurino’s goal to showcase the quality possible in Puglia, and I still see it as a perfect lens to view Negroamaro. The wine shows flavors of figs, licorice, underbrush, dusty rose, and stewed fruit—all characteristics commonly attributed to the grape. More recently, I discovered another excellent rendition of Negroamaro, one from the Pezzo Morgana vineyard, a 2.3-hectare (8-acre) parcel that lies in front of the winery Masseria Li Veli. Today, Masseria Li Veli is owned by the Falvo family, which sold its Tuscan winery, Avignonesi, and moved south to invest in a historic property built on medieval ruins at the beginning of the 20th century. As in many of Puglia’s top vineyard sites, the soil in Pezzo Morgana is mostly sandy, with calcareous rock beneath it, which provides crucial water retention in Puglia’s undeniably hot climate. Like many vineyards in southern Italy, this one is planted using the “alberello” (single vine) method—allowing each vine to grow like a bush, with ample space for its roots and leaves—to maximize direct light and offer ventilation. Aged for 1 year in oak (10 percent new), Li Veli’s Pezzo Morgana Salice Salentino Riserva tastes of mission fig, medjool date, ripe bing cherries, and dried oregano and has a medium to full body and a balance of pulpy fruit and smooth tannins. 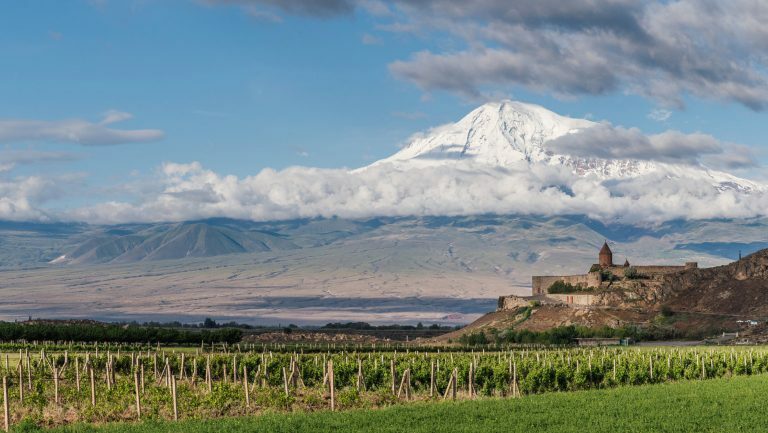 The combination of this grape variety and soil yields a wine of elegance, complexity, and minerality. And even though the wine has been recognized by Gambero Rosso’s Tre Bicchieri, like most Negroamaro bottles, it’s still affordable—under $50 on restaurant wine lists. Even the Antinori family has set its sights on Puglia, with its Tormaresca label. It purchased a magical property, Masseria Maime, in 1999. The stunning white farmhouse and winery sit as close to the coast as possible, in the middle of thick, alberello olive trees. Here, Salento’s heat is cooled by fierce winds from the adjacent beaches, which have views that stretch as far as the eye can see—that’s what makes it so magical. Among the Negroamaro spectrum of medium-bodied to full-bodied wines, Masseria Maime is in the middle—call it medium-plus. The cru wine is Tormaresca’s top Negroamaro, with firm structure, acidity, and a bit of richness. Once I had a grasp on Negroamaro, I came to find that Primitivo and Negroamaro played well together. Since I opened A16, a restaurant that sticks to all things southern Italian, I’ve befriended Paolo Cantele and had the opportunity several years ago to experience his hometown of Lecce, an exquisitely beautiful baroque city on the Salento Peninsula. If the Masseria Maime’s Negroamaro is on the structured side, Cantele’s Amativo, a blend of Negroamaro and Primitivo, is smooth and juicy, like eating a ripe plum. Paolo is the one who told me of how on typical “mezzogiorno” days, the work is done before the height of the afternoon sun and everyone is off to the beach. It’s just too hot. He’s also the one who showed me that Negroamaro also makes excellent rosato and is meant to be consumed in quantity. In San Francisco, Negroamaro is still far from a household name, but I’ve found that customers at A16 naturally gravitate toward Puglia when they learn about the link between Zinfandel and Primitivo. That familiarity opens the door for them to take a chance on Negroamaro, and when they do, they often experience reverse sticker shock—finding that these wines overdeliver on flavor for the price. Then they’re willing to order that second bottle with ease. Shelley Lindgren is the co-owner and wine director of San Francisco’s A16 and SPQR restaurants.